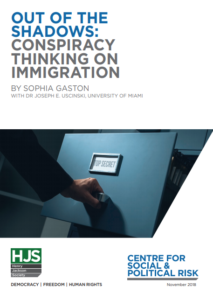 Out of the Shadows: Conspiracy Thinking on Immigration, a major new report by Sophia Gaston of the Centre for Social and Political Risk at the Henry Jackson Society, is published today. Polling conducted for the report shows 58% of British adults believe the Government is hiding the cost of immigration to taxpayers and society. The report finds that the rise in immigration levels and the public’s concerns about immigration have coincided with the weakening of trust in governments and institutions. These forces are mutually reinforcing, with politicians seen to have systematically ignored and disregarded citizens’ anxieties, challenging the contract that stands at the heart of Western democracies. The think tank undertook polling with Opinium to understand the number of British voters who had resorted to ‘conspiratorial thinking’ over the issue of immigration. 58% of all British citizens believe the Government is hiding the true cost of immigration to taxpayers and society. Only 12% disagree with the contention that the Government is hiding these costs. 51% of all Brits believe that successive governments have deliberately tried to make British society more diverse through its immigration policy. Of those who expressed a view, 59% believe that those who have spoken out about immigration in the media and politics have been treated unfairly. In a signal of how mainstream conspiracy thinking on immigration has become, 40% of Remain voters and 49% of Labour voters believe that the Government is concealing the economic and social costs of immigration. The report comes as Theresa May and her Government are scheduled to continue their promotion of the Withdrawal Bill by promoting it as a ‘step change’ on immigration policy. The report finds that distrust over immigration is far higher amongst Leave voters. 75% of Leave voters believe the Government is hiding the true costs of immigration – just 4% are convinced that the Government is not. Likewise, 65% of Leave voters believe that those who had spoken out on immigration had been treated unfairly. In news that will trigger alarm bells amongst Tory MPs, 62% of Conservative voters believe that the aim of Government policy over recent years had been to ‘make Britain more ethnically diverse’. “Given the out-sized role that immigration has played in our political life over recent years, these findings may not come as a surprise – but they should shock us profoundly. They reveal a fundamental strain on the political contract – that citizens no longer consider their own governments to act honestly or in the public interest on this most sensitive of issues. It is not impossible for democracies to function effectively with diverse populations, nor to unite such electorates around a common purpose. It is, however, extremely difficult to govern when social competition, resentment and fear preoccupies citizens, and when they lose faith in the independence and transparency of their institutions.